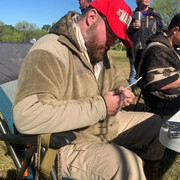 Hey, thanks for the awesome Texas Bushcraft Gathering 2019 this past weekend. I'm new to bushcraft, and definitely new to the community. I had an awesome time learning from everyone, and made some great trades with several people, and left with some awesome raffle gear! Thanks for this forum, and I look forward to learning from everyone here! Below is a picture of me at the gathering, maybe you met me there.